Weighty Matters: My Favourite Cookbook of the Past Two Years! You should ditch your bread maker! A few days ago in the comments I promised someone a positive post and so here it is. It's about a new cookbook I recently bought and am very excited about. It's called, Artisan Bread in Five Minutes a Day: The Discovery That Revolutionizes Home Baking and after a quick read and a trial run, I'm willing to bet it lives up to its billing. 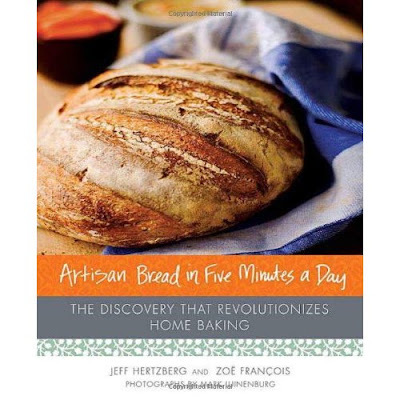 The premise is simple and builds off the concept of no-knead bread making. All you've got to do is mix the ingredients together (either by hand or via a mixer with a dough hook), stop, let rise for different amounts of time depending on recipe, put in fridge and then use on an as needed basis for up to 2 weeks! What that means of course is you've got a large batch of dough (enough for let's say 4-6 loaves) in your fridge and then when you feel like fresh, preservative free bread, where you've controlled and been in charge of every last ingredient, you simply cut off a hunk of dough, let it rise for 20 minutes and pop it into the oven in a loaf pan or on its own. The recipes look gorgeous, extremely easy to make and with stores like bulk barn selling all sorts of different types of flour, very inexpensive. If you want your own copy Amazon.ca has it for $22.56 CAD while Amazon.com has it at $16.00 USD (for the sake of transparency you should know those links are Amazon Associate links). You'll also want a pizza stone (on which to cook some of the recipes) and some lidded containers that will hold large volumes of dough in your fridge. Over the course of the past 2 years, it has become perhaps our most beloved cookbook!